The California Cannabis Health Information Initiative California public health authorities recently release a handout to help educate parents about how to deal with youth cannabis us: What Parents and Mentors Need to Know About Cannabis Use. National Multiple Sclerosis Society: “Although it is clear that cannabinoids have potential both for the management of MS symptoms, such as pain and spasticity, as well as for neuroprotection, the Society cannot at this time recommend that medical marijuana be made widely available to people with MS for symptom management. This decision was not only based on existing legal barriers to its use but, even more importantly, because studies to date do not demonstrate a clear benefit compared to existing symptomatic therapies and because issues of side effects, systemic effects, and long-term effects are not yet clear.” — Recommendations Regarding the Use of Cannabis in Multiple Sclerosis: Executive Summary. National Clinical Advisory Board of the National Multiple Sclerosis Society, Expert Opinion Paper, Treatment Recommendations for Physicians, April 2, 2008.http://www.nationalmssociety.org. The American Academy of Pediatrics (AAP) believes that “[a]ny change in the legal status of marijuana, even if limited to adults, could affect the prevalence of use among adolescents.” While it supports scientific research on the possible medical use of cannabinoids as opposed to smoked marijuana, it opposes the legalization of marijuana. — Committee on Substance Abuse and Committee on Adolescence. “Legalization of Marijuana: Potential Impact on Youth.” Pediatrics Vol. 113, No. 6 ( June 6, 2004): 1825-1826. See also, Joffe, Alain, MD, MPH, and Yancy, Samuel, MD. “Legalization of Marijuana: Potential Impact on Youth.” Pediatrics Vol. 113, No. 6 ( June 6, 2004): e632-e638h. 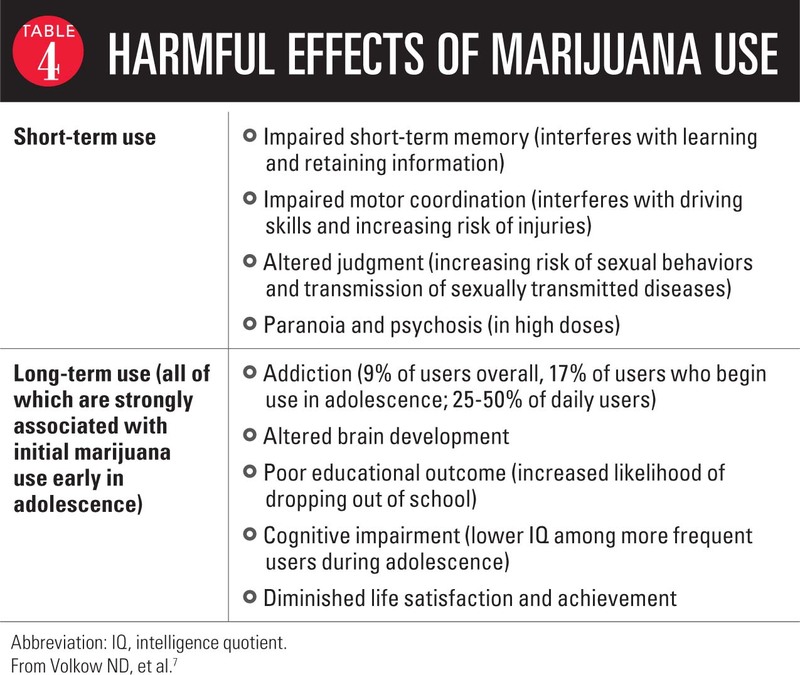 You may know that smoking marijuana can pose risks for a person’s physical health and brain development, especially for teens. But did you know that, for some people, it carries risks for their mental health, too? We don’t just mean short-term memory problems or poor judgment-those can happen for anybody who smokes marijuana. Long-term health effects are those that arise from regular cannabis use – especially daily use – over periods of months, years or decades. The time interval between the initiation of regular cannabis use and the development of long-term health effects may vary from several years to decades. 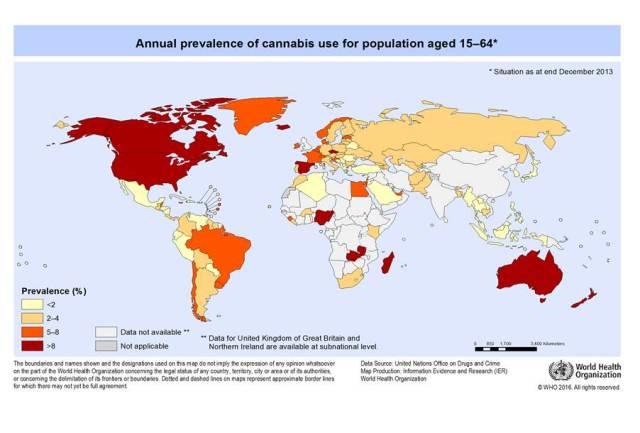 This report evaluates the evidence on whether long-term cannabis use is a contributory cause of the following health outcomes: dependence, cognitive impairment, mental disorders (psychoses, depression, anxiety and suicidal behaviour), and adverse physical health effects such as cardiovascular disease (CVD), chronic obstructive pulmonary disease and respiratory and other cancers. More information can be found in chapters 6 and 7 of this report.